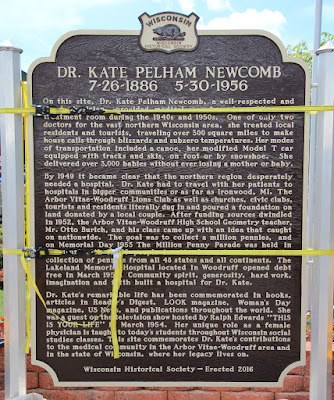 On this site, Dr. Kate Pelham Newcomb, a well-respected and loved physician, provided medical care from her office and treatment room during the 1940s and 1950s. One of only two doctors for the vast northern Wisconsin area, she treated local residents and tourists, traveling over 300 square miles to make house calls through blizzards and subzero temperatures. Her modes of transportation included a canoe, her modified Model T car equipped with tracks and skis, on foot [sic] or by snowshoe. She delivered over 3,000 babies without ever losing a mother or baby. 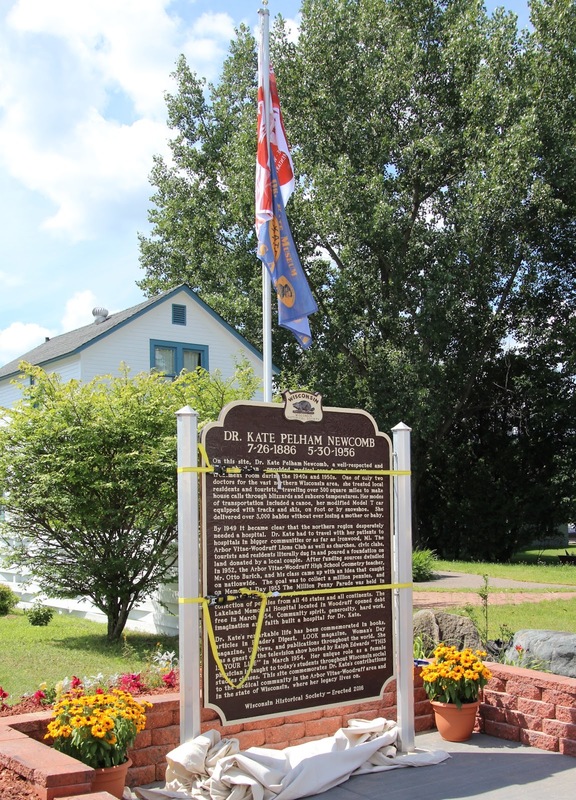 By 1949 it became clear that the northern region desperately needed a hospital. 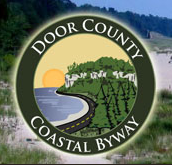 Dr. Kate had to travel with her patients to hospitals in bigger communities or as far as Ironwood, MI. The Arbor Vitae-Woodruff Lions Club [sic] as well as churches, civil clubs, tourists and residents [sic] literally dug in and poured a foundation on land donated by a local couple. After funding sources dwindled in 1952, the Arbor Vitae-Woodruff High School Geometry [sic] teacher, Mr. Otto Burich, and his class came up with an idea that caught on nationwide. 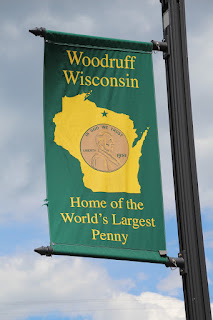 The goal was to collect a million pennies, and [sic] on Memorial Day 1953 [sic] The Million Penny Parade was held in Woodruff with 10,000 people in attendance to celebrate the collection of pennies from all 48 states and all continents. The Lakeland Memorial Hospital located in Woodruff opened debt free in March 1954. Community spirit, generosity, hard work, imagination [sic] and faith built a hospital for Dr. Kate. Dr. Kate's remarkable life has been commemorated in books, [sic] articles in Reader's Digest, LOOK magazine, Woman's Day magazine, US News [magazine], and publications throughout the world. She was a guest on the television show hosted by Ralph Edwards [sic] "THIS IS YOUR LIFE" [sic] in March 1954. Her unique role as a female physician is taught to today's students throughout [sic] Wisconson social studies classes. 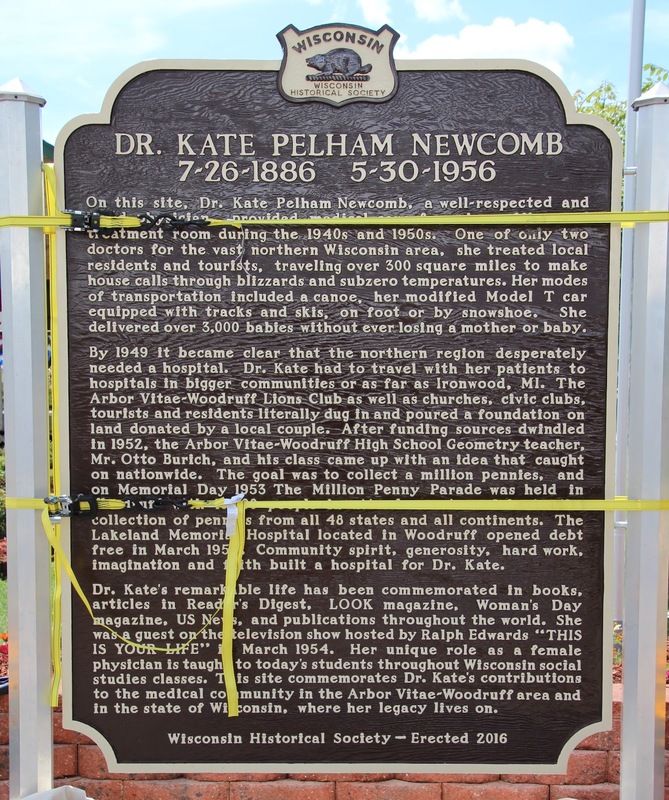 This site commemorates Dr. Kate's contributions to the medical community in the Arbor Vitae-Woodruff area and in the state of Wisconsin, where her legacy lives on. Oh, my goodness! Who proofread this for punctuation, grammar and syntax!!!??? 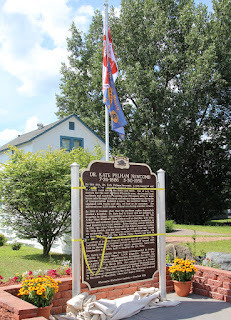 I've never before seen a State Historical Society "official" marker with these kinds of errors! 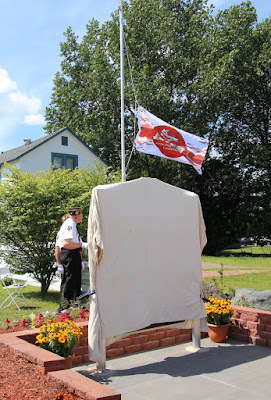 The marker is located at the Dr. Kate Museum, 923 2nd Avenue, Woodruff, Wisconsin 54568. 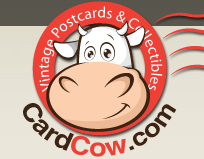 This link is filled with all kinds of penny facts. For example, 1,000,000 pennies placed side-by-side will cover an area of 3906.24 square feet! of her patients by snowshoe. The band played music from the 40s. Dexter and my friend, Karen Mielke, waiting for the festivities to begin. Members of V.F.W. Post 7898. The signing of the National Anthem . . .
Jill Lemke, HYMC Chaplin, gave the invocation (and benediction). Mike Timmons, Woodruff Town Chairman, gave the greetings. Arbor Vitae Town Chairman Frank Bauers also provided greetings. 1953 Penny Parade Queen (and first queen). are on display inside the Dr. Kate Museum. with generous permission of Dr. Kate Museum. More than 200 guests attended! about the Dr. Kate Museum for a school assignment. He spoke on his recollections of that project. her parents in "Memories of Mary & Otto Burich". honors Otto and Mary Burich. 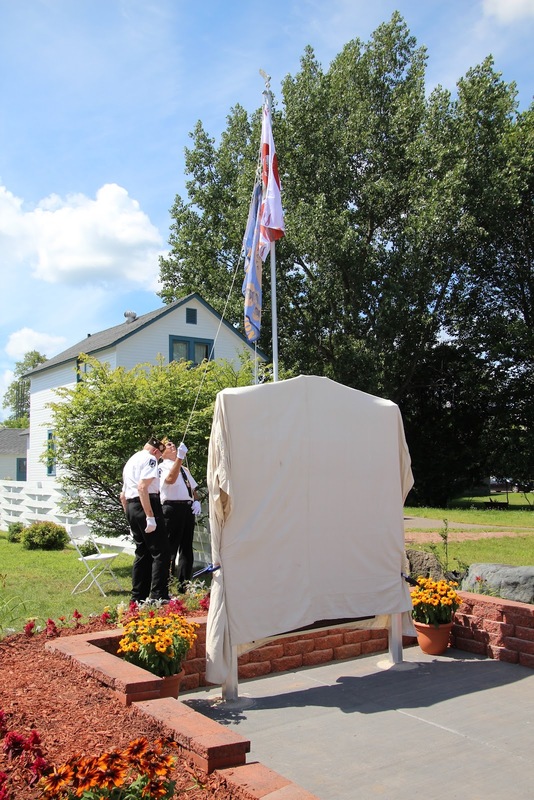 Flag raising ceremony by members of V.F.W. Post 7898. Vice President of the Dr. Kate Museum. Mike Newcomb spoke on "My Grandmother, Dr. Kate". Dexter and me . . .
Dexter and my friend, Karen Mielke. The daughters of Mary and Otto Burich. as the freshly-poured cement needs a week more to set. 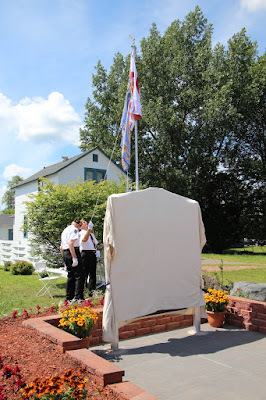 Mike Newcomb, Dr. Kate's grandson, reading the new marker. The museum complex (marker visible in the distance to the right). 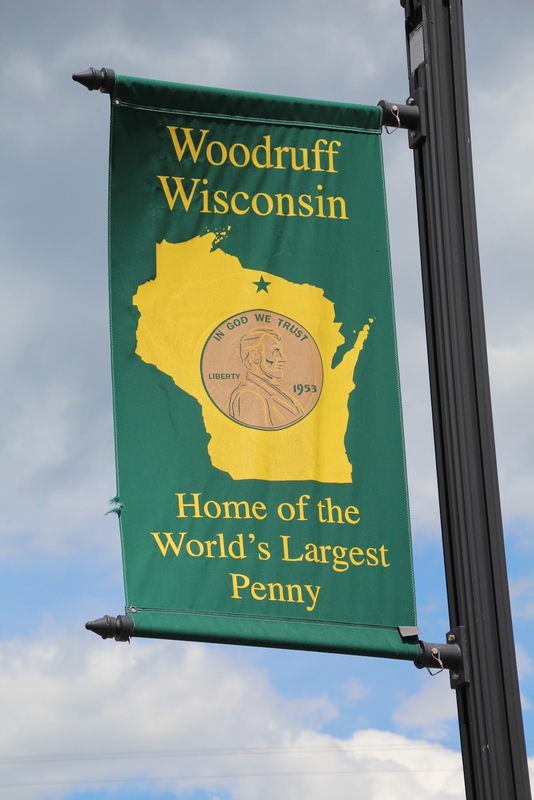 The marker is located in Woodruff, Wisconsin.